Some photographers have a camera bag addiction similar to Carrie Bradshaw and her Manolo Blahniks. But, not me. I am very practical. There has to be a reason for me to purchase a new camera bag. I have been using sling bags for a number of years and have been very happy with them. Both the Tamrac Evolution 8 and the Tenba Shootout Medium Sling are excellent bags. (Note – Kata, there is a difference between light-weight material and cheap material. Just take a look at the material used by Tamrac, Tenba and Think Tank and you will know the difference.) My problem has been trying to work around my Rode VideoMic. It is so long that I have stuffed in in the top of the sling under other things, making it annoying to pull out and use. Worse yet, I have left some lenses home just to make getting the mic easier. I have also been concerned about walking around with so much equipment. Carrying $10K worth of camera equipment can easily make you a target in some places. I finally realized that it would be great to have a camera bag that doesn’t look like camera bag. This is also a great reason NOT to use those branded camera straps and bags that say Canon. It screams, “I am a tourist in a strange place carrying lots of expensive things to steal.” Might as well paint a bulls-eye on your back while walking around Central Park. 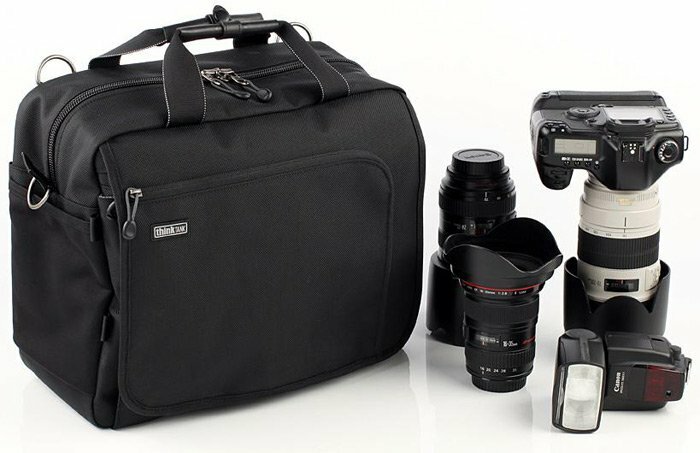 Several companies have released bags which do not look like camera bags. Lowe Pro released a complete line of bags called the Classified which look like soft-sided messenger bags. I tried very hard to talk myself into the Low Pro Classified 250 AW Pro. It’s a huge deep bag with plenty of room. Unfortunately, in person, it is also pretty ugly and not very professional looking. Ultimately, I found the Think Tank Urban Disguise 70 Pro V2.0. This is such a cool bag! It looks just like a soft-sided briefcase. In fact, it is about the size of my real briefcase, just wider. This bag is also part Think Tanks 2.0 series which has additional hooks and loops for attachments. Just unzip the top of the Urban Disguise 70 to reveal the cavernous interior. The above picture shows my Canon 7D with BG-E7 Grip attached to my Canon 70-200mm f/2.8 IS L AND my Canon 40D with grip attached to my Canon 100-400mm L! WOW! In the second image, you can see the 70-200mm L sitting with its cap next to the open center pocket. Also, in that photo, is the Rode VideoMic and the new Hoodman Cinema Kit Pro (HoodLoupe 3.0, HoodMAG 3.0, and HoodCrane attached) on the other side with plenty of room to spare. This bag has plenty of zippers and pockets to also carry filters, batteries, books, etc. It would even fit a Tablet, iPad or Netbook. (If you want a full 17-inch laptop, try the Think Tank Urban Disguise 60 Pro v2.0.) All Urban Disguise V2.0 bags includes an attached Seam-sealed Rain Cover to protect the bag from dust, water, snow, and other potentially harmful elements. As part of the v2.0 line, you can even purchase additional accessory straps to attach additional Think Tank modules and even a tripod. The Think Tank Urban Disguise 70 really is a great bag. It fits perfectly under my arm. It is actually shorter than both the Tamrac and Tenba bags, but it is much deeper than both. The heavy-duty zippers make it easy to get in and out of the bag quickly. And, since it can carry the 7D with a big lens attached, I am always ready for the next shot.